The New Orleans Saints last night selected University of Central Florida wide receiver Tre'Quan Smith with their 3rd Round pick, at #91 overall in the 2018 NFL Draft. The Saints were patient and selected their highest-rated player on their draft board, with the selection of Tre'Quan Smith. The Golden Knights senior stand-out racked up 1,171 yards and 13 touchdowns on just 59 total receptions last year, which is pretty remarkable since it means that he averaged a ridiculous 19.8 yards per catch. Now one of the more productive wide outs in the draft finds a new home in New Orleans, and gets none other than Drew Brees to be his first NFL QB. Smith was one of THE most underrated WR's in this year's 2018 Draft Class, and is a guy who can "take the top off" of a defense in a very similar way to current speedy veteran WR Ted Ginn, Jr. — but with a twist of Michael Thomas-like measurables. Standing at 6-foot-1, 202 pounds, Smith ran a 4.49 40 yard dash at the 2018 NFL Scouting Combine; but in my evaluation I'd say that he plays much "faster" than he timed. Additionally, he has great "burner" speed and high-points the ball well. But Smith’s best trait might be his ridiculously long arms — they're 34 1/2 inches to be exact — which gives him a big-time catch radius. He’ll go up and fight for jump balls against a DB, and he's capable of making some spectacular catches downfield and in traffic, with his impressively strong hands. Smith said he is committed to run-blocking (which his tape clearly shows), and loves to see his teammates do well. Brandon Coleman has been the Saints primary run blocking receiver previously, but Smith will come in and compete for the #3 WR spot. 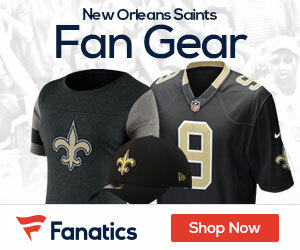 Saints general manager Mickey Loomis called Smith a "very smart player". He is a perfect fit for the Saints high-powered offense and gives Brees another deep threat along with Ginn. If the Saints hadn't lost Willie Snead to the Ravens in Free Agency, I'm not so sure that the Saints would have targeted him; but he most certainly will fill the void that was recently opened by Snead's departure. At Central Florida, Smith was the main guy in their offense and they often relied on him to make big plays; and he delivered in a big way. UCF went 13-0 last season, and were the only undefeated team in the nation. Smith has stated he has gotten better each year (he didn't start playing until his junior year in high school) and still hasn't even reached his full potential yet, since he essentially is still learning HOW to play the wide receiver position, and learn things such as route-running technique. He also struggled to separate at times from press coverage, and he'll need to develop his skills in the short passing game to become a more versatile and well-rounded player. But his potential to be a great WR at the next level is "off the charts". He clearly will benefit from being "coached up" by Saints WR coach Curtis "CJ" Johnson. Smith sat down with the Saints early in the draft process and watched film with the staff, and it's there when the Saints fell in love with his positive attitude and willingness to grow as a player. The Saints receiving depth chart is now Michael Thomas, Ted Ginn, Jr., Cameron Meredith, Brandon Coleman and now Tre'Quan Smith — and that is a scary-good WR corps for Brees to throw passes to, going forward. And perhaps most importantly: his selection definitely will help New Orleans alleviate some of their third down failures, from last season. Writer for Saints News Network and Canal St. Chronicles, Brenden will be a hoping to attend the Louisana State University to get a sports jourlisam major. Football player, student of the game.